Capstone announced today that Citizens Energy Group, through its subsidiary Kinetrex Energy Exploration & Production, has acquired a 50% working interest in oil assets in Knox County, Indiana from Trey Exploration. Capstone advises Kinetrex Energy Exploration & Production, a subsidiary of Citizens Energy Group, in acquiring oil assets in Knox County, IN from Trey Exploration. As a third party advisor, Capstone’s expertise was critical in identifying the opportunity and providing deal advisory, valuation and negotiation assistance to help finalize the investment. 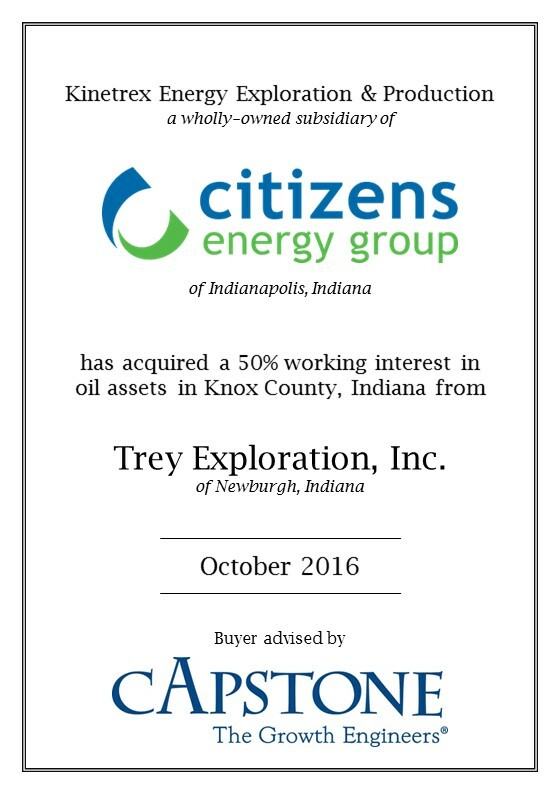 Capstone Strategic, Inc. (Capstone) announced today that Kinetrex Energy Exploration & Production (KEEP), a subsidiary of Citizens Energy Group (Citizens), has acquired a 50% stake in oil producing assets in Knox County, Indiana from Trey Exploration, Inc. (TEI). Capstone advised KEEP on the transaction. KEEP is a subsidiary of Citizens focused on the exploration and production of oil. Founded in 1887 as a public charitable trust, Citizens is a broad-based utility service company providing natural gas, thermal energy, water and wastewater services to about 800,000 people and thousands of businesses in the Indianapolis area. TEI primarily engages in the exploration and production of oil and gas resources in the Illinois Basin and other hydrocarbon producing areas across the United States. The company has also conducted geological studies in areas across the United States and in international markets. TEI was founded in 1987 by Howard A. Nevins. The company provides the highest standards of conduct and is environmentally responsible. Capstone assisted in structuring a deal to establish a long-term partnership between KEEP and TEI. Both companies will use their complementary skills to increase production by using enhanced oil recovery techniques, drilling additional wells, and by exploring deeper geological formations. KEEP will provide additional geological studies while TEI will continue to operate the property. “As a third party advisor, Capstone’s expertise was critical in identifying the opportunity and providing deal advisory, valuation and negotiation assistance to help finalize the investment. We are pleased to begin working with TEI today and for many years to come,” said Aaron Johnson, President of KEEP. “We are excited to bring together two companies with this partnership. KEEP’s investment in Knox County and partnership with TEI will allow Citizens to reinvest more of its oil and gas profits into providing unparalleled utility services to consumers for many years to come.” said Capstone Managing Director John Dearing. Capstone Strategic, Inc. is a management consulting firm located outside of Washington DC specializing in corporate growth strategies, primarily mergers and acquisitions for the middle market. Founded in 1995 by CEO David Braun, Capstone has facilitated over $1 billion of successful transactions in a wide variety of manufacturing and service industries. Capstone utilizes a proprietary process, “The Roadmap to Acquisitions,” to provide tailored services to clients in a broad range of domestic and international markets. Learn more about Capstone online at http://www.CapstoneStrategic.com. Citizens Energy Group provides safe and reliable utility services to about 800,000 people in Indianapolis. Citizens operates its utilities only for the benefit of customers and the community. Kinetrex Energy Exploration & Production is a wholly-owned subsidiary of Citizens. Additional information is available online at http://www.CitizensEnergyGroup.com – Facebook – Twitter – YouTube. Capstone advises Kinetrex Energy Exploration & Production, a subsidiary of Citizens Energy Group, in acquiring oil assets in Knox County, IN from Trey Exploration.Capstone advises Kinetrex Energy Exploration & Production, a subsidiary of Citizens Energy Group, in acquiring oil assets in Knox County, IN from Trey Exploration.